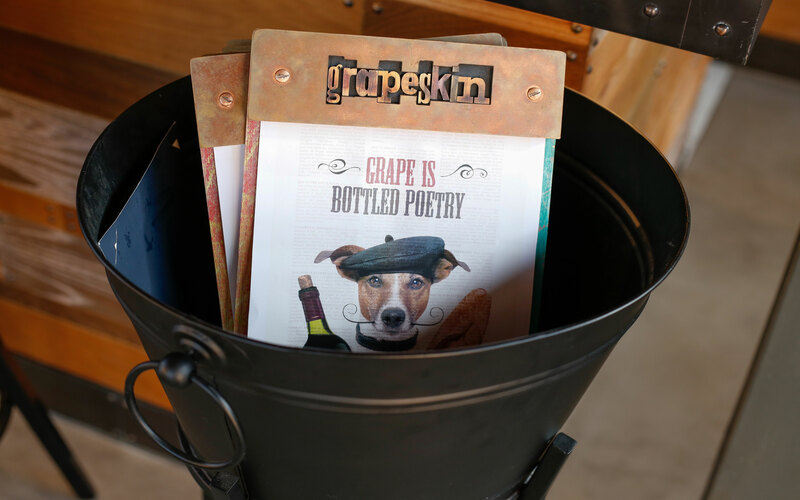 Grapeskin – tucked away in the courtyard of La Ville hotel, is a contemporary grape bar and kitchen located in Citywalk, one of Dubai’s trendiest neighborhoods. 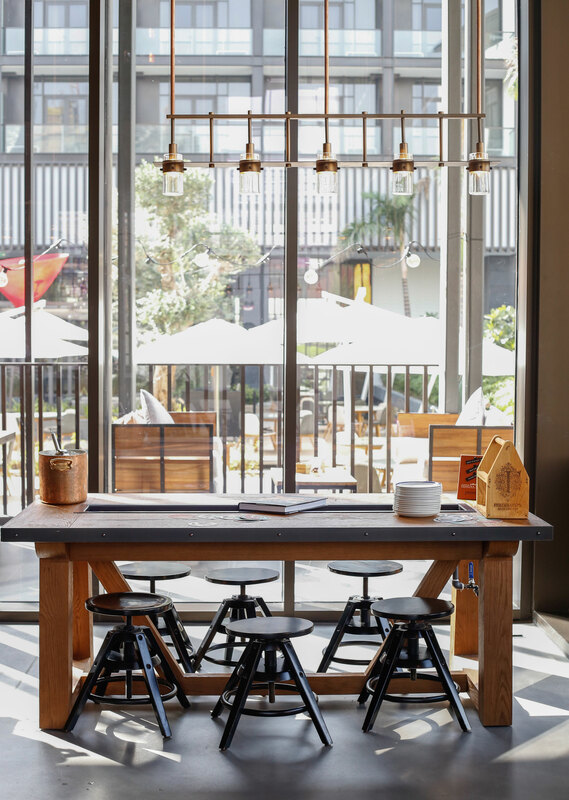 Bright open spaces, industrial and rustic furnishings and carefully selected decor set the right vibes for a fun afternoon/evening out! I love how this place is classy, yet casual and chic at the same time. 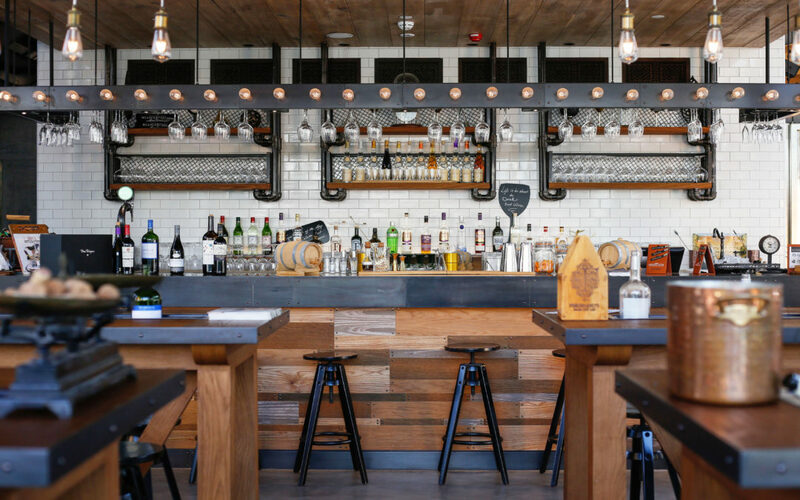 It’s perfect for relaxing after work or catching up with friends. 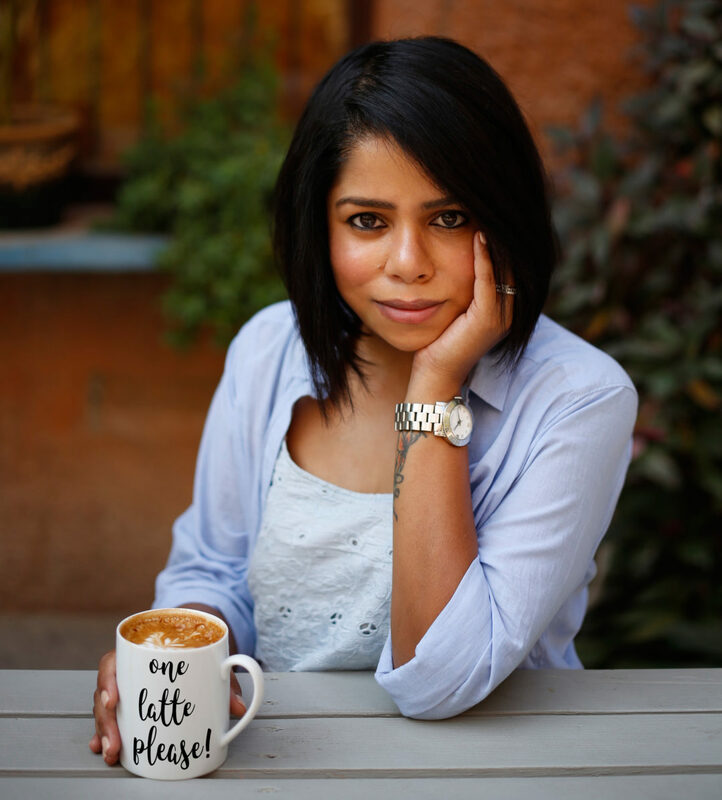 Yes – Grape is bottled poetry! 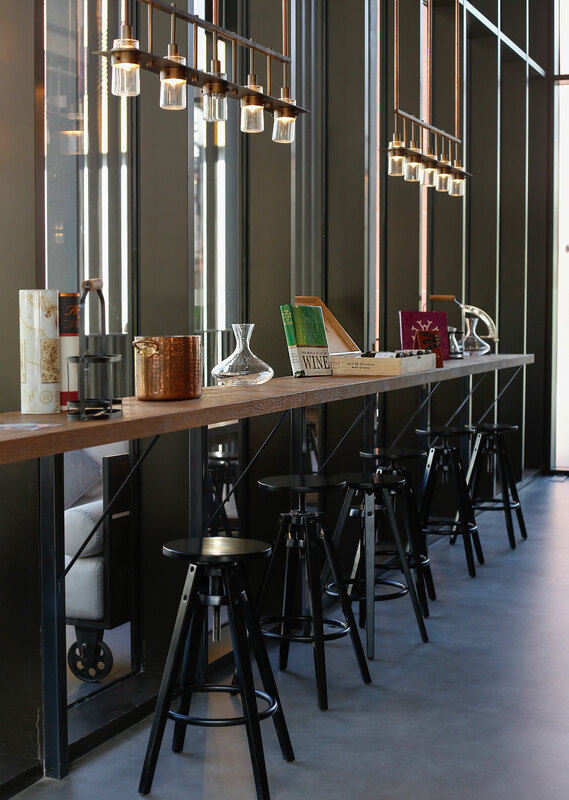 You can sample some of the world’s finest grapes while Grapeskin’s very knowlegebale team take you on a journey through the vineyards without ever having to leave Dubai! I had the pleasure of chatting with Rebekah Littlechild, grape wizard at Grapeskin. We started off with the two popular punches, Mr. Red and Mr. White. An unoaked (not aged in an oak barrel) pinot noir is used to make Mr. Red. However, if the guest does want a drop of oak extract, it can be added to the bottle. Cinnamon, beeswax and oud maceration is added along with grape bitters. I have never before tasted this unique combination of flavors. You can taste undercurrents of rose and oud from the very first sip! And to jazz this drink up a little more, it is sprayed with a hydrosaul of cinnamon and oud. This immediately changes the taste to give it more earthy and spicy tones. Similarly Mr. White is created using unoaked chardonnay. To this, a maceration of fennel and honey and grape bitters is added. This concoction is served over ice and is wonderfully refreshing and juicy. 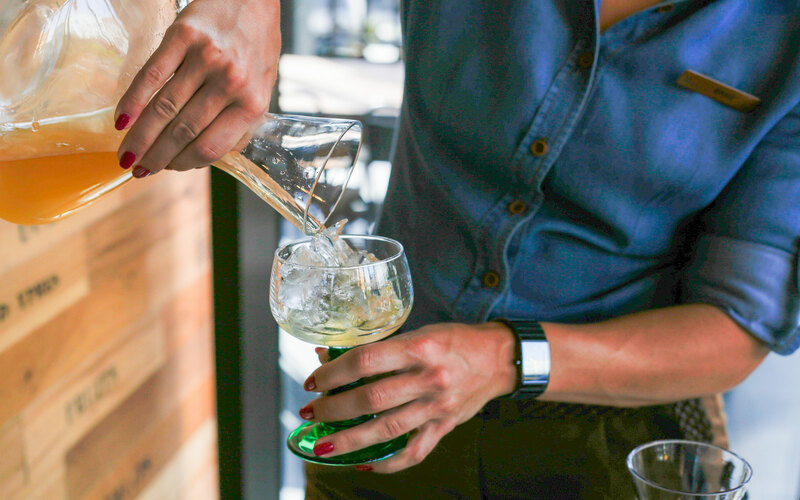 And just like the red punch, a distillation of fennel and bee pollen is sprayed on your drink. This revs up the taste giving it more floral and fresh undertones. 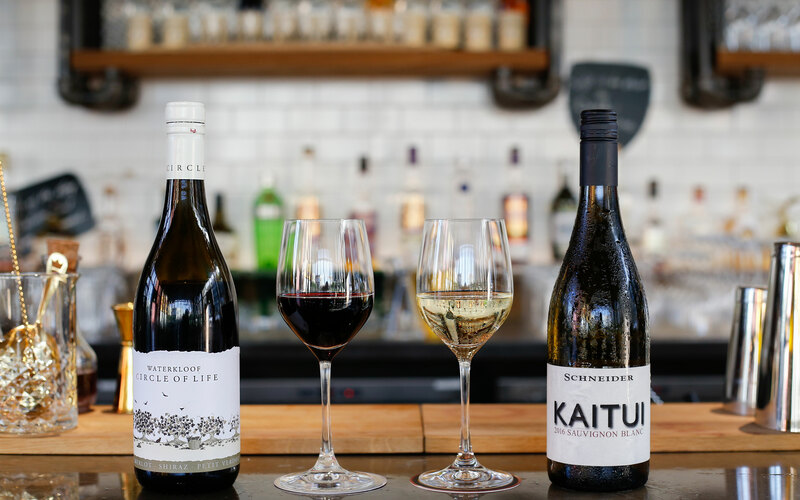 The Waterkloof and the Schneider Kaitui are two of Grapeskins bestsellers. 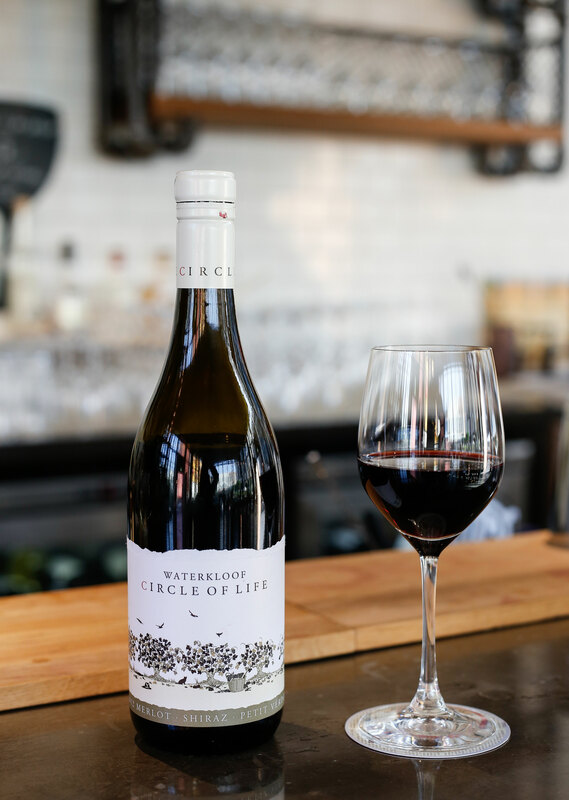 The Waterkoof, a bordeaux blend, is made in the vineyards of South Africa. It is a medium bodied wine, has a rounded tannin and the predominant taste is of dark fruits, black current and bramble. No pesticides, chemicals or preservatives are used to grow the grapes and the whole process from start to finish is environmentally friendly. 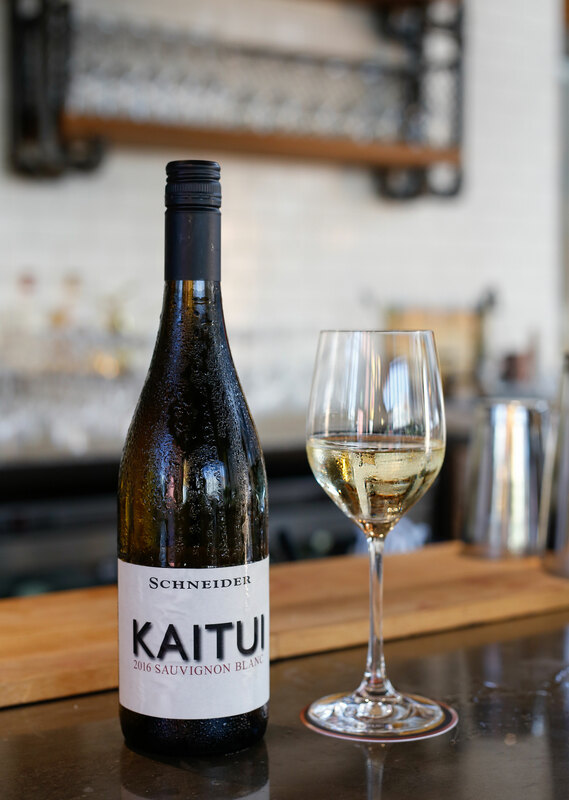 The Schneider Kaitui, is a German wine but the original vines come from Marlborough, New Zealand. So you will find it tastes a bit like the latter, however the main difference being that the Kaitui is more intense. It is a fresh, light bodied wine with a tropical taste (pineapple, mango) and a lime on the finish. 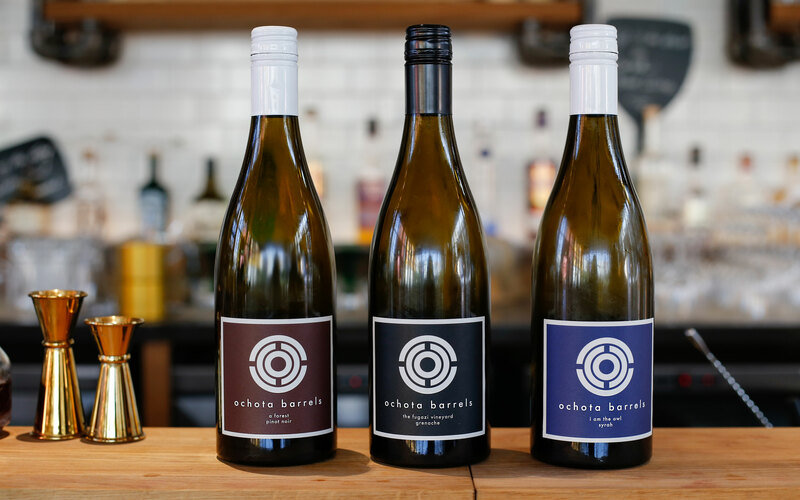 The Ochota Barrels are made in Australia and they are imported just for Grapeskin. These wines have extended maceration, where the skin is left on the grapes as it ferments for an extended period of time. This gives the wines more structure. They are all biodynamic wines as well. This means that there is very minimum intervention from the wine maker right from the time the grape is on the vine till it is bottled. Where there is wine, there is cheese! Contrast – As a compliment to a salty or intensely flavored cheese, a wine with a higher sugar content or a juicy wine is recommended. 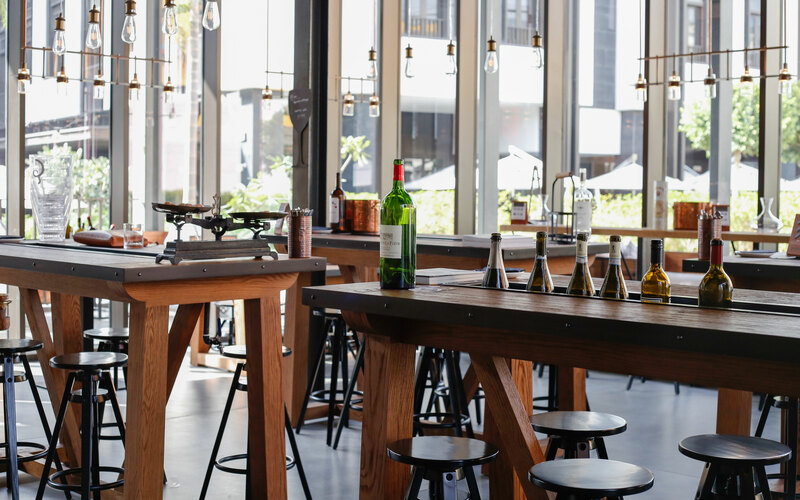 Another tip is a handy phrase ‘what grows together, goes together’ in reference to pairing an earthy dish like mushroom risotto with an aged pinot noir as it typically expresses complimentary leafy or forestry tones whilst being juicy and light. An example of the perfect cheese board would maybe contain a hard cheese ex. a Cheddar or Comte, a semi-hard cheese ex. a Tomme or a Gruyere, a soft cheese like a goat cheese and a blue cheese (if you are a fan). 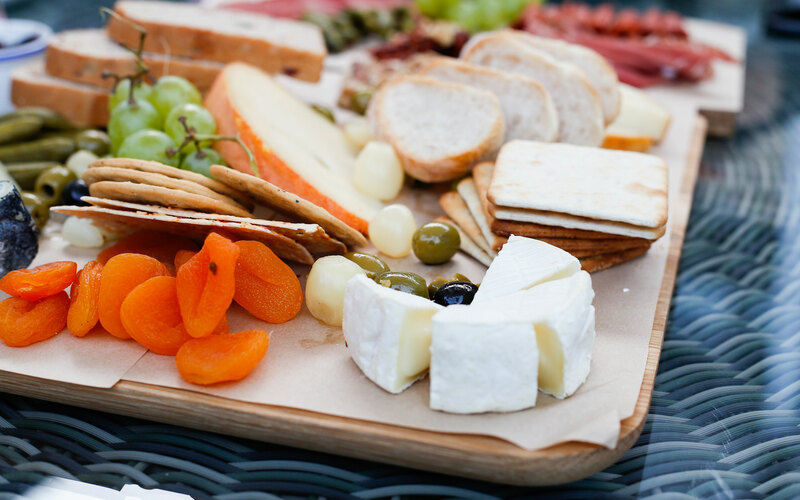 A number of food items pair well with cheese like crackers, toasted fruit bread (goes with salty cheese), pickled onions, cornichons, sundried tomatoes (all go with mild and creamy cheese) nuts and dried fruits. Take out your cheese from the fridge an hour before serving it. Having it at room temperature brings out the flavors a lot more. Ideal temperature for red wine which is medium bodied is 20 deg C. (mild room temperature). 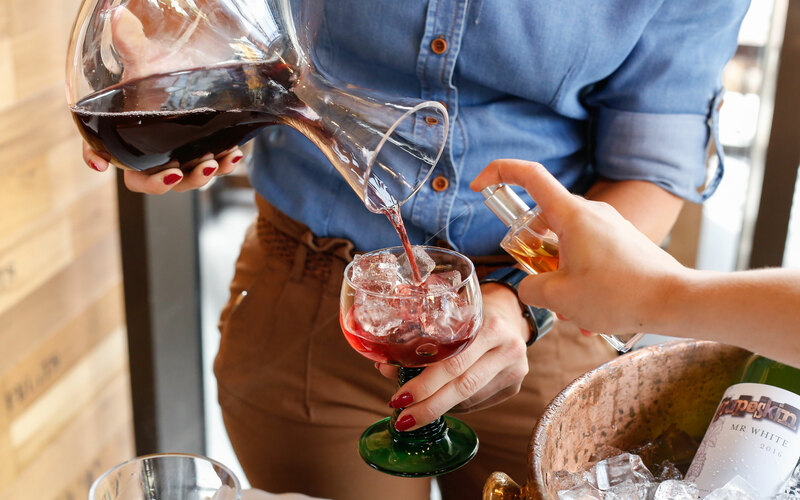 If your red wine is lighter in body or fruiter, a refreshing way to try it would be at a slightly lower temperature, so leave it in the fridge 20 minutes before you open it. 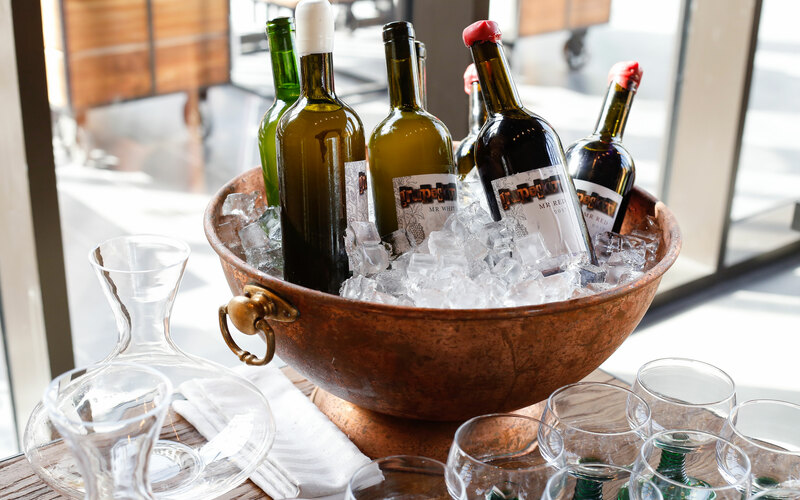 For medium bodied or more structured white wines, they tend to express more flavor when not served directly from an ice bucket. So try to take the wine out of the fridge 30 minutes before drinking or serving. For fresh and fruiter white wine, chill to 5 deg C before having a glass. Store all your wine in a dark and cool room if it is not in the fridge. This will avoid it going through too many temperature and light transitions as that could affect the quality of the wine.